Former staff members of the Church of Ireland College of Further Education will continue their industrial action against poor treatment, loss of personal benefits, loss of autonomy and the termination of programmes following the college’s incorporation into DCU last year. 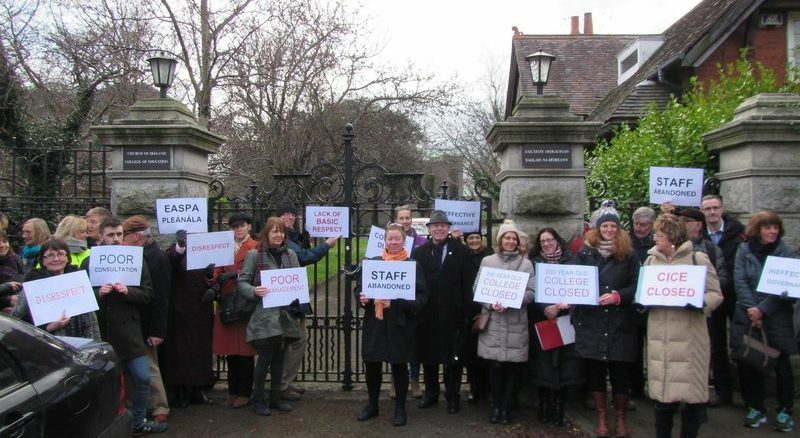 Students and staff of the college took to the picket line outside its former premises in Rathmines a fortnight ago demonstrating against a host of problems they say have arisen following its closure and subsequent amalgamation into DCU last year. The Support Group added that staff feel extremely aggrieved at the level of disruption at both a personal and professional level as a consequence of the move into DCU, noting a multitude of issues they feel must be resolved. Among the problems put forward are: poor management of the transfer from Rathmines to DCU, a loss of personal benefits to all staff, loss of professional autonomy and benefits by academic staff, the termination of CICE programmes, lack of clarity regarding financial, administrative and support services for students transferred to DCU and concern for the conditions of part-time academic staff. The DCU Incorporation Programme was finalised in September 2016, seeing CICE, St. Patrick’s Drumcondra and Mater Dei Institute combine with Dublin City University to create one single legal entity. CICE was closed, moving to the university’s new Drumcondra campus to create the Institute of Education, DCU’s fifth faculty alongside St. Pat’s. Responding to the protest, Chairperson of the Board of Governors of CICE, Archbishop Michael Jackson, said every effort had been made to accommodate those completing studies under the old arrangements. He added that the Board recognised from the beginning that disturbances would arise during the transition into DCU, but that at every point it had sought to keep staff and students informed through updates and consultation. According to Archbishop Jackson, the Incorporation Programme was directed upon CICE by the Department of Education and Skills in 2012 and its move to another provider carried forward by successive Ministers of Education: Ruairi Quinn, Jan O’Sullivan and Richard Bruton. DCU have stated they are not involved in any negotiations on either side of the action.